A very interesting session we did with Olivier, who could put his hands on these five minis. Not sure all these whiskies have also been bottled as ‘full’ bottles. Glen Grant - Glenlivet 15 yo (46%, Cadenhead, black dumpy, 1980’s) Colour: pale gold. Nose: oh, this is superb. Starts on a lot of honey (rather whole beehives), wax polish and wood smoke, with a slight OBE. Goes on with very obvious notes of chestnut liqueur like they make in Ardèche (in France’s Massif Central mountains). Even more smoke after a moment, then very ripe strawberries and mirabelles. Also a little menthol, leather and fresh walnuts. Absolutely top notch. Mouth: interesting that there are exactly the same kinds of notes as on the nose, which isn’t that common. Then we have a little more mint. Excellent. Finish: long, a tad jammier, going back to malt and chestnut honey. Comments: top notch and highly drinkable, with a perfect balance. SGP:443 – 91 points. Glen Grant - Glenlivet 16 yo (80°proof, Cadenhead, black dumpy, 1980’s) Colour: amber. Nose: we have a fantastic sherry here, reminding us of a very old Palo Cortado. A lot of old walnuts, bitter chocolate, very old Armagnac, honeydew, liquorice wood and pu-erh tea. Magnificient. More menthol again after a moment. One of the best cough syrups we ever had. Cough, cough! Mouth: a tad less complex now but beautifully balanced between three main flavours: mint, honey and walnuts. Finish: long, just a tad woodier now (obvious tannins), with touches of peat. Comments: a grand whisky again. They sure knew how to select their empty casks! SGP:442 – 91 points. Glen Grant - Glenlivet 18 yo (46%, Cadenhead, black dumpy, 1980’s) Colour: pale gold. Nose: this one is much more on spices, ginger and pine resin, as well as rather more malty and spirity. Quite some gentian and liquorice wood, unusual hints of tomato sauce, ginger, nutmeg, sage… Actually, this one is the simplest so far but it’s still very nice. Whiffs of peat and almond milk. Mouth: better now. A lot of orange marmalade, ginger and overinfused tea, too bad it gets a bit tannic. Blackcurrant jelly. Slight OBE. Finish: medium long but with more honey. Comments: very good but less good than the younsgters. Dry. SGP:352 – 85 points. Glen Grant - Glenlivet 22 yo (46%, Cadenhead, black dumpy, 1980’s) Colour: full gold. Nose: much more vegetal, resinous, with a lot of encaustic and then milk chocolate, coffee and chestnut honey like in the beautiful 15yo. A tad rougher and more spirity than the latter, that is. Hints of dust and ‘new’ newspapers. Mouth: again, this is rather beautiful but rougher than the younger versions. Resins, cough drops, walnut skin and green apple more in the background. Finish: more on fruit spirit, kirsch, with something a little rubbery. Again, less grandiose than both the 15 and the 16 but very, very good. SGP:461 – 87 points. Glen Grant - Glenlivet 26 yo (46%, Cadenhead, black dumpy, 1980’s) Colour: mahogany- reddish. 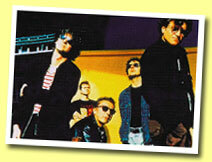 Nose: it seems that we’re back to the 16’s style, but this is even bigger. Huge notes of prunes, Corinth raisins, very old rum, getting almost tarry. No sulphur at all, that is. Goes on with notes of szechuan pepper, caramelized ribs, ham… Quite exceptional I must say. There’s also a little peat smoke as well as notes of coal oven. Fab nose. Mouth: hugely concentrated but not cloying at all. Raisins, prunes, black tea, Havana cigar and chocolate. Finish: long, just a tad tannic at the end (grape skins) Comments: excellent once again, but the 16 was even greater in our book. Ah, youth! SGP:541 – 90 points. Cutty 12 (vs Chivas), USA, 1978. Teaser: "Which One Is "Best"? Body:There is no one "best" Scotch. No one "best" automobile. No one "best" yacht. The best is whatever most suits your taste. That's one thing that makes life so enjoyable. Finding out which things are best by trying them all. 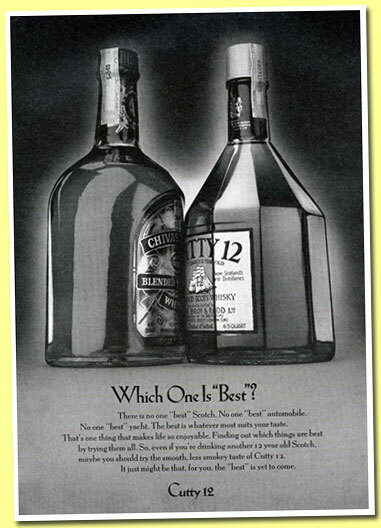 So, even if you're drinking another 12 year old Scotch, maybe you should try the smooth, less smokey taste of Cutty 12. It just might be that, for you, the "best" is yet to come. Cutty 12"
That's what we call treading very carefully. MUSIC – Recommended listening: a guy called Zomy Woof (not zomby) playing the great master's Watermelon In Easter Hay.mp3 in an otherworldly manner. Alas, I think you can't buy this, but you may browse this fantastic website. No I didn't quote the original composer, did I? Longrow 7 yo 2000/2008 (55.8%, OB, Refill Bourbon / fresh Gaja Barolo cask, 12,120 bottles) I had the occasion to try this several times but always postponed, until a very good friend sent me this sample. It has to be said that I adore most of Angelo Gaja’s wines. Colour: gold/orangey. Nose: my first feeling is ‘hey, not that bad!’ Speaking of oranges, there are quite some oranges in there, mixed with kind of a mustiness (wet wool, old wine cellar) as well as notes of candied apricots, kumquats and ginger/pepper. The peatiness comes through slowly but surely, and this never gets vinous as such. Very pleasant notes of verbena and lemon balm as well, not very common. We’re positively surprised, especially since there’s no sulphur at all. Mouth: what to say? It’s very thick, very concentrated and very demonstrative. One can feel the nebbiolo’s usual harshness and roughness when it’s young (remember great wines never fully mature in cask, but have to spend quite a few additional years in their bottles to get drinkable), but also the oak’s big influence, almost new oak style (ginger, nutmeg, pepper). The spirit manages to have its say despite the casks’ loud and constant chattering and the sum of all that produces something that’s rather pleasant. Something like peated, spiced kumquats? Finish: long, coating, big, with an added saltiness on top of the orangey notes. Comments: I do prefer the ‘neat’ versions, like the very excellent CV, but I have to say this is well made. I believe Springbank made some huge progresses in their wine cask finishings, even if we’re very far from ‘traditional’ whisky here. Tradition? Isn’t that for old people? Anyway, easily my favourite finished Longrow ever. SGP:755 - 84 points. 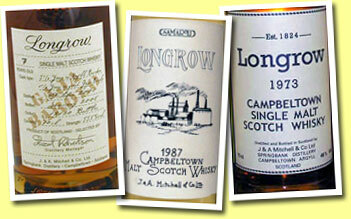 Longrow 1987/1999 (45%, Samaroli, 360 bottles) Colour: white wine. Surprise! Nose: plain Longrow, CV-style, minus the slightly buttery notes (and minus the wet wool). Very straightforward, very peaty. Right, we do have faint touches of gooseberries in the background but that’s all. Ultra-clean. 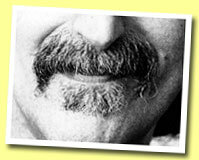 Mouth: I tried it h2h with the CV and both are rather close, which is great news as I love the CV. You may read our notes for the CV there. Finish: clean and long. Excellent peatiness and saltiness. Comments: one of the cleanest Longrows I could try, but maybe also one of the less complex. Zing! SGP:347 - 88 points. Longrow 1973 (46%, OB, large digits, golden screw cap, SC999, 75cl, mid 1990’s) The older version of the 1973 has got a huge reputation but oddly enough, this batch hasn’t. Colour: full gold. Nose: starts on a rather bizarre mix of warm butter, grenadine (very, very big) and vanilla fudge and develops more on orange marmalade, blood oranges (big), menthol, slightly stale sea water and ginger. Highly unusual. Pleasant? Hard to say… The notes of blood oranges are great, for sure, but the whole isn’t excellently balanced I think. Mouth: it’s bit better now, but still a little unbalanced. Quite some salt, oranges, medium peat… Notes of cardboard as well, hazelnuts, kippers… Finish: long and very, very salty, to the point where salt almost overwhelms the rest. Slightly dusty aftertaste. Comments: not quite a disappointment, it’s still very good whisky of course, but very far from the earlier batch (or from the stunning 1974’s) in my book. Please don’t buy the newest batch for the price of the earlier one on evilBay (see pictures)! SGP:324 – 84 points. Chivas Regal, USA, 1976. 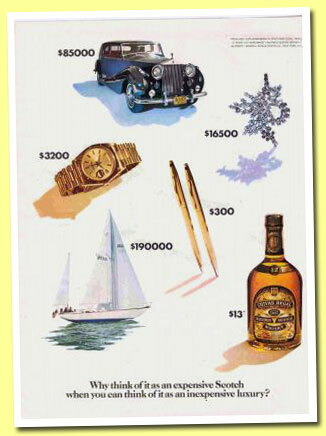 "Why think of it as an expensive Scotch when you can think of it as an inexpensive luxuy?" 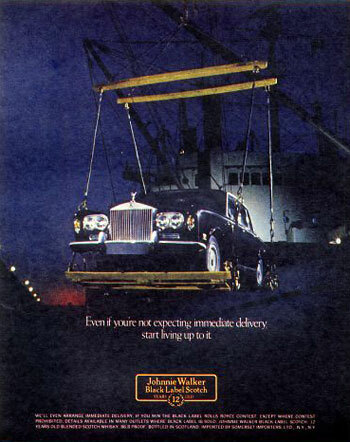 Rolexes, yachts, Rolls Royces or diamonds, both Chivas Regal and Johhnie Walker Black Label where using them a lot in the 1970's and 1980's. Here's an example, from 1976 as well. 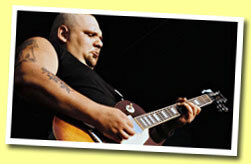 MUSIC – Recommended listening: let's have some very good jazz today with the very excellent Canadian guitarist Adam Smale and his combo doing Fun city.mp3 (from his debut CD Fun City). 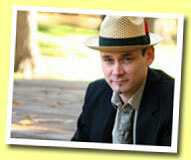 Please buy Adam Smale's music. I agree nobody should give a damn about the differences between two almost unobtainable 1937 Strathislas by the same bottler, but how could I resist trying these two antiques, now that I got the samples on my desk? Furthermore, I usually don’t post notes about the ‘benchmark’ malts I’m trying to use every time I start a series (to calibrate nose and palate and to have a ‘starting point’) but as I just checked that I never posted any notes for the popular Strathisla 12, well, here we go. 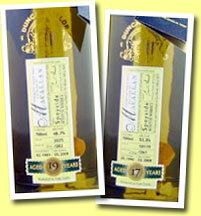 Strathisla 12 yo (40%, OB, +/- 2006) Colour: gold. Nose: malty and honeyed at first nosing, with also hints of toasted oak and sherry. Also faint floral notes (our beloved dandelions) and very pleasant hints of orange blossom and orange zests. Maybe not a huge personality but the whole is pleasantly fragrant. Mouth: more ‘Chivas’ so to speak, malty and nutty, with notes of cake and coffee but little fruitiness. Hints of orange marmalade. Finish: rather long, still quite malty, with a little honey in the aftertaste. Comments: more than just an average Speysider. Very drinkable ‘just like that’, without having to scratch your head too much. SGP:441 - 81 points. Strathisla 34 yo 1937 (43%, G&M Connoisseur’s Choice, Pinerolo, old black label, rotation 1972) Where does this rotation year come from? Well, one may only know of the ‘rotation year’ for some malts when they came from the original cases, usually for Italy, as these ‘rotation years’ used to be written on them. Sometimes Belgian bottlings had them as well, including on labels or back labels. Colour: full gold. Nose: starts on superb honeyed and waxy notes (a whole beehive) together with splendid floral whiffs. Then there’s more resinous and minty notes, a little camphor, hints of old wood and leather, sandalwood, orange liqueur… What’s truly amazing is how close to the recent 12yo we are here, even if the oldie is much deeper and more complex. Nice OBE developing after a few minutes (metal polish – not bad, mind you!) Only one word: great. Mouth: a tad soft and shy at first sipping but it picks up steam after a few seconds, with a blend of resinous, oaky and orangey notes as well as a little mint. Far from being as great as on the nose but certainly not kaput. Gets then even more resinous, dry and salty, which is rather unexpected. Hints of peat in the background. Finish: not too long of course and even saltier than before. Kippers? Notes of green tea. Comments: 34 years in wood plus 36 years in glass won’t kill a whisky it seems. Moving… And what a nose! SGP:362 – 88 points (that is to say 92 for the nose and 84 for the palate, should I decompose the score). 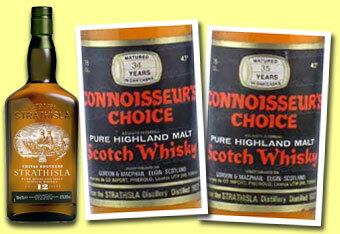 While I’m at it, very old bottles often display low levels and many think the whisky’s dead. Yet, that's not always the case, we’ve seen high levels with ‘dead’ whiskies and low levels with very assertive and youthful whiskies. I think the key issue is the ‘haziness’ of the liquid. Flat or dead whiskies get usually kind of ‘drab’, and only translucent (or sometimes completely opaque) instead of limpid. 1 – Old black label – until late 1970’s – age on main label and sometimes on large shoulder label, vintage usually on main label, no bottling year. 2 – Old brown label (aka brown banner label) – early 1980’s to late 1980’s – age on main label, vintage on main label, no bottling year. 3 – Old map label (aka cream label) – late 1980’s to mid 1990’s – usually no age statement – vintage on main label – usually bottling year on small neck label. 4 – New map label – mid 1990’s to 2007 - no age statement – vintage on main label – bottling year usually on small neck label. Various colours. 5 – Newest map label – from 2008 on – no age statement – vintage on main label – no bottling year it seems. MUSIC – Recommended listening: dance music on whiskyfun? 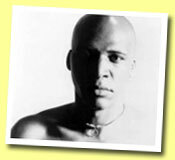 Well, why not, when it's made by very talented musicians such as Haiti's Jephté Guillaume. This is called The Prayer.mp3 (acroostix mix - what does that mean?) and it's from 1997. Please buy Jephté Guillaume's music. Bruichladdich 1998/2008 ‘Manzanilla’ (46%, OB, 6,000 bottles) It’s to be noted that Bruichladdich worked only for a few weeks in 1998, and had been silent for a few years before and then until 2001 again.Colour: gold. Nose: this is very, very winey at first nosing but it’s in no way an ‘added’ vinosity. Everything is very coherent in there, the notes of bitter oranges and very ripe melons quickly leaving room for drier aromas such as apple peelings, walnut liqueur, almond milk, marzipan and café latte. Gets fresher and fresher after that, sort of purer and cleaner, mostly on apple juice. Also hints of stout and just a very faint rubber (inner tube, not unpleasant at all) as well as touches of herbal tea (maybe rosehip.) Not exactly a sherry monster on the nose, the spirit and Manzanilla work very well together I think. Mouth: this is even sweeter than on the nose – so much for dry sherry. A lot of orange marmalade, plum jam and crème brûlée with notes of walnuts again and something pleasantly ‘nervous’ and slightly prickly (icing sugar) playing with your tongue. Finish: medium long, clean, a little maltier and toastier. Hints of peat. Comments: very, very good. Let’s hope they’ve still got some casks from these 1998 distillations. SGP:632 – 87 points. Bruichladdich 1998/2008 ‘Oloroso’ (46%, OB, 6,000 bottles) Colour: gold/amber with salmony hues. Nose: what’s rather surprising is that whilst manzanilla is drier than oloroso, this whisky is a little drier than its sibling on the nose. We’re closer to a classic Bruichladdich, with the whiffs of melons, apricots and even gooseberries flying around, and then more typical notes of oloroso, such as chocolate, praline and raisins. Finally more grassy notes (walnut skin, apple peeling.) Almost no vinosity at all this time. 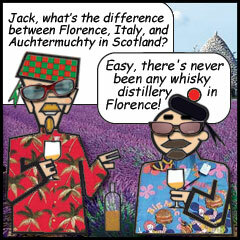 Mouth: this is a whisky we’d call ‘gourmand’ in French – sorry, never found a similar term in English. Much richer and sweeter than on the nose, and hence sweeter and richer than the manzanilla version, with also a more obvious peatiness here and quite some spices (quite some pepper). Other than that it’s all on chocolate, sultanas and various fruit liqueurs, including orange and maybe date arrack. Finish: long, still sweeter than the manzanilla, with even a few bubblegummy notes but no icing sugar (or fructose). Comments: it’s not bold and thick first fill oloroso, which can be seen in the colour. Maybe a tad youngish again but already very, verypleasant. Also, we’re maybe closer in style to a good sherry finishing that worked well. Let’s say I liked the manzanilla just a tad better, mainly because it’s more unusual. SGP:633 – 86 points. Bruichladdich 1986/2008 (53.4%, OB, fresh sherry, Stillman Ruaridh Macleod, Munich Festival, cask #531) 1986 was the year when they filled a lot of sherry casks at Bruichladdich, and most bottlings we could try ranged from very good to excellent. Colour: full amber/brownish. Nose: it’s very interesting to try this against the 1998 oloroso because in these times where many bottlers try to rush maturation, that really shows that longer ageing does bring more complexity indeed. Okay, up to a certain point. This is much more complex than the 1998, with many various aromas such as, at random, chocolate, olive oil, camphor, beeswax, dried pears, coffee and raisins, and then just like in the 1998, a few grassier notes. More green tea here. Big notes of orange liqueur after a while. There’s also quite some rubber again, maybe not too far from sulphur this time, much more than in the ‘Manzanilla’. I have to say that that plus the notes of olive oil may not please everyone… Mouth: too bad, it is the kind of ‘rubbery sherry’ that I detect here on the palate, and frankly it’s not easy whisky at all. Tar, pepper, rubber bands like we chewed at school, heavy spices, very strong black tea, tannins… Maybe you have to be a fearless Münchner to really enjoy this. Actually, I’m sure some people like this a lot but for me, it’s not exactly on ‘the right side of sherriness’ if I may say so. Finish: long but bitter and tannic. Blackcurrant buds tea. Comments: there are several other 1986 Bruichladdichs that are way better than this very extreme version in my book, starting with the Country Life version. You just can’t only have stunners within one vintage I guess, but once again, some guys may love this ‘extreme-ness’. Too bad, it all started very well at first nosing, but I finally liked both younger 1998’s much better. SGP:371 – 78 points. 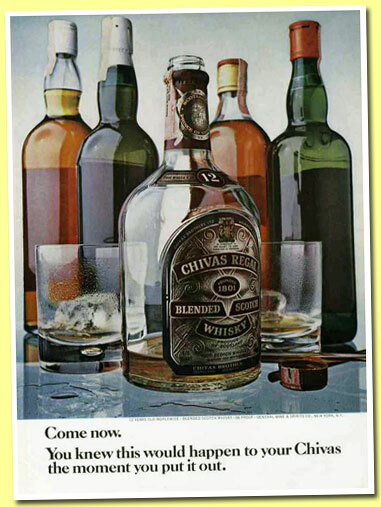 Chivas Regal, USA, 1970. "Come now. You knew this would happen to your Chivas the moment you put it out." A theme that Chivas has used and abused over the years. Will you guess which are the other brands/bottles? Redbreast 12 yo (40%, OB, John Jameson, 750ml, 1970’s?) Many think that Redbreast is one of the best Irish and we won’t argue, so it’s a thrill to be able to try an older version of the 12. Too bad we don’t have the current version at hand for proper comparison (our last bottle has been emptied since a long time) but sometimes old tasting notes are useful and we still have vivid memories of the whisky. Colour: amber. Nose: extremely unusual. Much less fruity than the new 12 and much more on the other main dimension of it, that is to say pine resin and wood varnish. A lot of cough syrup, old camphor, huge notes of marzipan and candle wax, Barbour thornproof dressing (really! ), ink… Certainly not what we’d call an ‘Irish nose’ and you never know whether all this was there originally or if it was brought by glass maturing, but what’s sure is that it’s simply great. Great experience. Mouth: quite punchy and rather ultra-dry now, almost like, say, amontillado at the attack. Unfolds after a moment, that is, with again something resinous, old walnuts, chestnut honey, bitter chocolate and olive oil. Hints of aniseed (pastis). Again, this is highly unusual but very good (you know, both notions are sometimes related when you’re trying a lot of whiskies.) Finish: shortish but unexpectedly fruity, as if the bananas and guavas had waited until the very last minute to ‘say hello’. Comments: great, great stuff. I’d love to put my hands on a full, unopened bottle of this (yeah, as if I was the only one…) SGP:271 - 90 points. 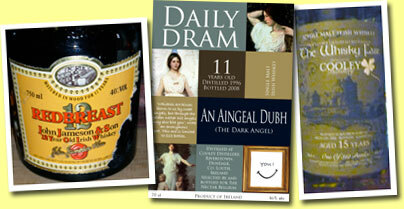 An Aingeal Dubh (The Dark Angel) 11 yo 1996/2008 (46%, The Nectar, Daily Dram, Cooley, 212 bottles) Colour: pale gold. Nose: now we’re Irish, with a rather big fruitiness blending apples, gooseberries and bananas (not lots) and various other fruits with grassier elements such as plain grass and green tea. Also a little wax but much less than in the old Redbreast. Gets more orangey after a moment (squash), with also hints of linseed oil. The more Scottish of all Irish on the nose. A lot of presence. Mouth: one word: pleasure. Fruity but not ‘youngish’ at all, slightly oily and phenolic for good measure (again, more phenolic than most unpeated Irish I could try up to now), and perfectly balanced. Hints of bananas Bushmills-style. Finish: medium long, in keeping with the palate except for an added ‘roughness’ that’s anything but unpleasant (strong tea, pepper.) Comments: just amazingly drinkable. Next time, do magnums! SGP:731 – 88 points. PS: it’s amazing how Cooley’s whiskies are becoming great with more age, whilst I didn’t like them too much when they were young. 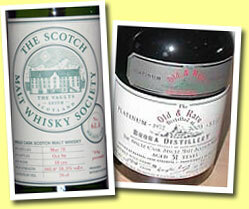 Cooley 15 yo 1992/2007 (56.4%, The Whisky Fair, bourbon barrel, 312 bottles) Colour: straw. Nose: this is much drier and closed than the Dark Angel, starting with almost no fruits and rather on alcohol, oak, grass and even notes of antiseptic and glue. Typical of a malt that needs water to wake up. So, with water: that brought out wilder notes (like peat without the smoke, if you see what I mean) but no further development. Funny how this one seems to be a little anaesthesized, whether neat or watered down. Mouth (neat): it’s more talkative than on the nose when undiluted but still not as ‘wide’ as the Dark Angel. More or less the same profile, maybe a tad fruitier and a tad less phenolic. A tad more ‘Irish’ if I may say so. With water: now we’re talking! More bananas, guavas, papayas, pears, baked apples, aniseed and even a little mint and quite some spices. Finish: similar to the Dark Angel but longer and even more satisfying. Comments: a lazy Irish but when it wakes up, it rocks! Water is obligatory for that purpose. SGP:632 – 87 points. Arette Anejo (38%, OB, 100% agave) Distilled in pot stills, only from agaves from the Jalisco plains, and matured in bourbon casks. Colour: straw. Nose: starts half medicinal and half rooty/earthy. Whiffs of gentian, camphor and cinchona, the whole being very fresh and very clean. Of course there’s also these aromas that we couldn’t describe with other words except ‘tequila’, or ‘cactus’? Bitter oranges, orange liqueur. Not much wood influence it seems. Mouth: not as ‘weakish’ as I would have expected at 38%, but smooth and fresh, maybe a tad less complex than on the nose (that wasn’t too complex either). Pears, ginger, root infusions (more gentian tea here, also rooibos), ginger tonic, gin (and plain juniper). Finish: medium long and more gingery now. A tad sugary as well. Comments: we’re far from malt whisky of course and again, I have no experience. What’s sure is that it’s very well made, but it’s rather an aperitif than a spirit that you would slowly sip after dinner. SGP:550 – as a whisky lover, I’d say 75 points, but tequila lovers may rate this higher. Reserva del Senor Anejo (38%, OB, 100% agave) From the Rio de Plata distillery. The agaves come from Los Altos fields. Colour: pale gold. Nose: this is much, much less expressive than the Arette, and much less ‘tequila-alike’. Actually, I wouldn’t have said this was tequila, and it makes me rather think of some ‘foreign’ attempts at making whisky. A little grainy and candied, notes of tea, vanilla, ginger tonic, oranges again, a little wood smoke, charcoal (BBQ)… Also slightly almondy. Maybe a bit undetermined, especially when compared to the very neat and straightforward Arette. Mouth: very round and very vanilled, lacking body in my opinion. Finish: short, leaving only a lot of vanilla on your tongue. 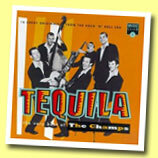 Comments: not very ‘tequila’ after the Arette, hence quite pointless to us whisky drinkers. Not a big spirit. SGP:430 – no rating. 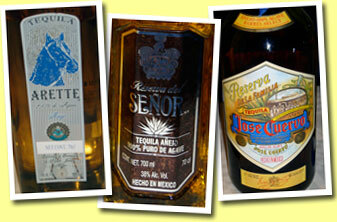 Jose Cuervo Anejo ‘Reserva de la familia’ 2007 (38%, OB, 100% agave) Matured in oak casks for more than five years. Colour: full gold. Nose: this is clearly something else, a much more complex spirit that seems to have its eye on both rum and whisky. Very fragrant, though, starting on huge notes of church incense, then mint, camphor, bandages, gentian (in that sense it’s much closer to the Arette than to the Reserva del Senor), developing on orange blossom, rosewater, gingerbread (very big notes) and ginger tonic, with just hints of caramel. Very superb, I must say. Mouth: yes, this is excellent. Great attack, not too powerful but smooth and ‘wide’ flavour wise, with more wood than on the nose. It’s clearly a spirit that one may try H2H with a very good rum and a very good malt whisky. Excellent bitterness in the back, roots, ginger, bitter oranges, cinnamon (quite a lot – loads, actually), plums, figs… Very, very good. Finish: quite long, in the same vein except for an added sugariness that we already found in the other ones and that you almost never get in whisky. The aftertaste is almost as much the aftertaste of a liqueur. Comments: great stuff to have in your bar. We’re just wondering, do they also make this at 43%, or better yet, at cask strength? SGP:552 – 87 points (again, on a ‘Scotch scale’). And thanks to Alexandre @ La Maison du Whisky. Please note that this review was written without knowing how this whisky was made, as it came in as a ‘confidential’ preview sample one month ago or so. This one is to be launched on October 1 but we could already spot it on World Duty Free’s website and at Laviana's (where the picture comes from). Anyway, let’s say this is ‘half-blind’ tasting. 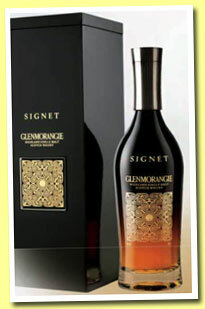 Glenmorangie ‘Signet’ (46%, OB, 2008) We’re trying this H2H with an older Glenmorangie 12yo ‘Côtes de Beaune’ finish, that was quite a success in our book in the ‘plain wine’ finished category (among quite some misses in our opinion.) Colour: amber/orange. Nose: well, it does smell a bit like sherry-finished whisky but not only that, as if there was something else in the mix. Maybe new oak? Rather fragrant, with rather obvious notes of old roses and old-style perfume (musk, patchouli), then vanilla, bitter oranges and ginger. A little paraffin as well. Gets finally much toastier, sort of roasted (coffee beans) before returning to fruitier notes (blackcurrants). Always quite some ginger and nutmeg, rather typical of new or first fill oak. Very nice nose altogether, only the rather heavy notes of paraffin are a bit too much for our taste. Mouth: it’s a little more on the winey/honeyed side again at the attack (very ripe strawberries) but that’s soon to be counterbalanced with the same notes of toasted oak as on the nose. Very sweet and rather nervous. There are clearly these two ‘families’ of aromas, both being easily identifiable, but just as what happened on the nose, it’s the oak that wins at the end, thanks to its very spicy signature (the usual soft curry, dried ginger, white pepper and nutmeg.) Finish: long, the oak almost speaks solo now, with quite some tannins and even a little mustard. Comments: I’m wondering whether the two main kinds of casks that were used here – or so it seems – were used consecutively or if they were simply blended before bottling. Either way, it’s another very good ‘modern’ whisky by Glenmorangie, kind of the missing link between their experiments with wine casks (Côtes de Beaune, for instance) and new oak (Artisan Cask, Astar and all the single casks). It works, and I guess the various combinations of both ‘universes’ can make for endless variations. SGP:531 - 87 points. Update: after a phone call with Glenmorangie’s skilful Rachel, we learnt that they partly used some roasted and ‘chocolate’ malt in this whisky, that is to say rather ‘rare’ malt that was exposed to higher temperatures. Missouri oak-alike oak was used as well, the whole being a complex combination of various barleys/malts, ages and types of casks. Gosh, we didn’t pick the ‘roasted malt’ side of the combo at all, maybe we should go back to tasting Fanta… Fantafun.com, how does that sound? As for this new Glenmorangie packaging, well, all we can say is that it reminds us of Dior's j'adore quite a lot, even if less so than the 25yo. Should we expect the lovely Charlize Theron behind LVMH/Glenmorangie's tables at Whisky Live Paris? Maybe better than some kilted Scots, if you ask me... Or maybe not. MUSIC – Recommended listening: one of today's most wonderful guitar duos, Frenchmen Sylvain Luc and Bireli Lagrène (Bireli's Alsatian, actually) play Henri Salvador's Syracuse.mp3. 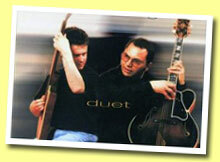 Just superb... And please buy these maestros' music! Macallan 19 yo 1989/2008 (48.7%, Duncan Taylor, Rare Auld, cask #3025) Colour: straw. Nose: starts a bit rough but pleasantly so, quite malty and caramelly. Quite some oak as well, hints of fresh mint, a little wood smoke… Gets then also a little mouldy (moist cellar, wet wood – yes, barrels). Hints of pears, chocolate and liquorice. Rather lively, getting fruitier over time. Mouth: rather nervous again, starting very malty once again, with quite some liquorice and candy sugar, then bitter oranges and marmalade. Full bodied and assertive, with again kind of a smokiness in the background. Very faintly rubbery. Finish: long, with the oak playing a larger part now. Caramel and tannins. Comments: a very, very ‘all right’ version of Macallan, rather close to the official ‘Fine Oak’ range in style but with more oomph. SGP:452 – 85 points. Macallan 17 yo 1990/2008 (53.3%, Duncan Taylor, Rare Auld, cask #10119) Colour: straw. Nose: this one is rounder and more polished than the 1989 despite the higher strength (and the younger age). Mocha, malt, cut apples, vanilla and praline. Also a tad spirity, let’s try it with a little water. With water: it got much grassier and yeastier, as if the cask’s work had been cancelled. On the other hand, we get some very nice notes of fresh almonds. Mouth (neat): oily and round mouthfeel but oddly enough it’s rather fruitier and fresher than the 1989 on the palate. Notes of pineapple sweets, white chocolate, malt (lots again) and then herb candies (like Ricola, if that rings a bell to you.) Maybe just a tad sugary, but let’s see what happens with water: once again, it gets hugely vegetal and grassy and loses its fruitiness. 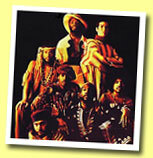 Who said bizarre? Finish: rather long but still quite grassy. Comments: this one isn’t Michael Phelps (right, I’m French, so I should say Alain Bernard I guess.) Better keep it undiluted. SGP:371 – 82 points. MUSIC – Recommended listening: Cameroon's great Sally Nyolo singing DJini DJome.mp3. 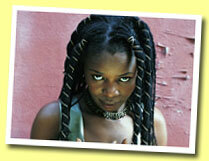 Please buy Sally Nyolo's music and support African music! 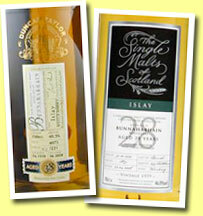 Bunnahabhain 38 yo 1970/2008 (40.3%, Duncan Taylor Rare Auld, cask #4073) Colour: gold. Nose: this is one of these uberfruity old Bunnahabhains it seems. Starts very assertively, on a hints of putty mixed with loads of fresh oranges and tangerines, bananas, acacia honey and whiffs of spearmint. Gets then a tad more ‘fudgy’, with also notes of cappuccino and vanilla as well as a little tea (earl grey – obvious notes of bergamots here) and toasted oak. Very fresh considering this one’s age, but not exactly a fruit bomb because there’s more than that. Usually the palates don’t match the noses in these old whiskies but you never know… Let’s see. Mouth: starts rather similarly (citrus fruits) but – should I say ‘of course’ – the wood is much more obvious, albeit not too drying. Nicely integrated. The other obvious notes are of the resinous kind (pine candies, chlorophyll gum). Not too ripe bananas (tannins). Finish: surprisingly long, half oaky, half orangey. Orange tea? Comments: very, very good, with a rather stunning nose and a pleasant palate. SGP:640 – 89 points. Bunnahabhain 28 yo 1979/2008 (46%, The Single Malts of Scotland, cask #18831, 234 bottles) From a bourbon barrel. Colour: pale gold. Nose: this one is a completely different whisky. I don’t know if it’s the distillation regime at Bunnahabhain that changed but this is much grassier and sort of zesty, with notes of lemon juice and green apples, green bananas, vanilla and plain apple juice. Faint whiffs of menthol as well, barley, warm milk… Not very deep but extraordinarily fresh at 28yo. Mouth: this one has more presence than the 1970, with quite as much oak but also the beautiful spices that go along. Ginger, soft curry, nutmeg… Other than that it’s all on ‘processed fruits’ (apple compote, dried pears, pear cake) with a little praline and notes of almonds (marzipan). Finish: maybe not the longest but still quite fruity, clean, leaving your mouth as fresh as a baby’s. Comments: Bunnahabhain isn’t the malt that usually displays the biggest personality, and this is no exception, but balance and cleanliness make this old one most pleasant. Funny that the notes of pears remained after all these years. SGP:531 – 89 points. MUSIC – Recommended listening: when one of our favourite male singers (and guitarists) does one of our favourite female singers' favourite songs... 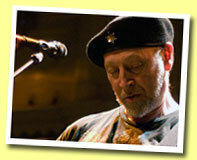 It's Richard Thompson doing Joni Mitchell's Black Crow.mp3. Please buy all these wonderful people's music! 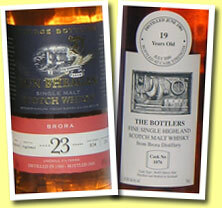 Brora 23 yo 1981/2005 (48%, Dun Bheagan, cask #1512, 648 bottles) Colour: full gold. 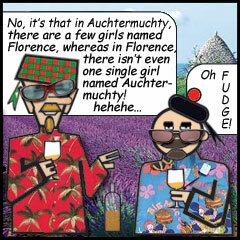 Nose: we’re very, very close to Clynelish as we know it today here, except that this is a tad more mustardy. Other than, that we’re all on beeswax, paraffin, roasted nuts, bread crust and apple compote, with faint whiffs of iodine. Rather big notes of quince jelly arising then, as well as a little sweet wine (Maury or Rivesaltes and the likes) and dry sherry. Back on mustard and smoke at the end. Mouth: a punchy, peppery and candied attack, very nervous, with quite some peat and hints of fructose (or kiwi). Gets sweeter and sweeter after that, almost sugary, with various jams (apricots, plums, orange marmalade) and quite some oak. Gets also a little bitter (grass, leaves, oak). Finish: long, half-sweet, half-grassy, with rather big tannins. A tad drying. Comments: very good but it’s like if the cask and the spirit didn’t totally mingle together. SGP:464 - 83 points. We take this opportunity to point you towards these interesting explanations regarding Spanish/Sherry casks on Bruichladdich's blog. MUSIC – Recommended listening: our Alsatian compatriots Kat Onoma play La Chambre.mp3 (that was on their 1995 CD 'Far From The Pictures'). Please buy Kat Onoma's music.